This past weekend I headed to the Battlebunker in Oakville ON to play in the Canadian GT 2008. I was playing my freshly painted Deathwing modeled after the original Deathwing from the short story. The Army is definitely a finesse one and a couple of times I made the mistake of letting a horde get to close without softening them up first. I will update with more pictures as I get them, hope you enjoy. I had a great time, thank you to all my opponents and travel companions for making it a great weekend! Comments: Great game that came down to the wire and literally the last turn. My army was not meant for taking on horde armies and this game was an example of me happening to hang around and score enough pts to get a tie. Comments: The game had escalation and I was able to kill 500 pts of his army in the first turn (everything on the board). The rest of his army showed up and 1200 pts of Orks killed my 1700 pts of Deathwing to a man and took all table quarters. I think if I had been a little more conservative I could have brought this to a tie but Orks in a city are hard to deal with. Comments: Josh was playing a Steeler heavy force with a 2 shooty fex's, a shooty tyrant and a flying CC tyrant. By the end of the game he had one fex left and he was backing up as the Deathwing started to surround him. Comments: Scott's luck was dicey at best and left him in the 3rd turn to never return. Mine was retarded and I didn't fail a save (either type) from then on. Deathwing are very good at killing Death Guard. Comments: Paul's Army is amazing and he won best presentation for it. Both Paul and I played the character of our armies and it made for an awesome amount of CC throughout the game. Kudos go to his Stormboyz nob who killed my Librarian in CC. Overall I had a great time and met a bunch of new gamers including Yoshi, who ended up winning best overall. 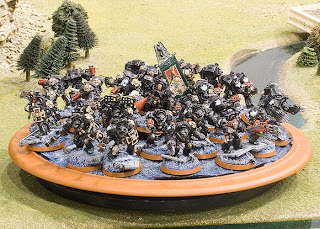 I needed up placing 15 out of 32 and learn a lot of valuable lessons about how to play an all terminator army. Good looking models, lets see more close up photos as you are a good painter. I just found your blog and like the pictures and reports of your Deathwing. I too have a Deathwing and am learning how to use it.